Yep, that gorgeous turkey to your left could be on your table with just a little bit of work (but work well worth it). First of all, if you are using a frozen turkey, you need to have it defrosted the day before cooking. It should sit in the brine overnight for best results. The brine gives it a nice, dark color. 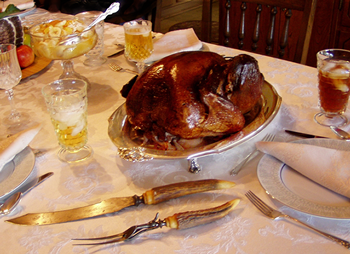 If you elect to smoke your turkey, as in the illustration, you can get a nice, mahogany color to bring to the table. Grandma Virginia’s dressing – if you don’t have a good dressing for your Thanksgiving turkey, I strongly recommend this one. I like mine a bit on the moist side, and I usually add more liquid. Now, for dessert, pumpkin pie is a favorite. Besides just offering recipes, we have a Study in Pumpkin Pie, which begins with a startling announcement. We start off in this examination of pumpkin pie with a hard truth. Most U.S. pumpkin pie is a lie.